The vast Gobi Desert takes up much of southern Mongolia, but rather than sand dunes, it is mostly a barren, rocky wilderness and temperatures range from minus 40 degrees Fahrenheit (minus 40 degrees Celsius) in winter to 104 F (40 C) in summer. 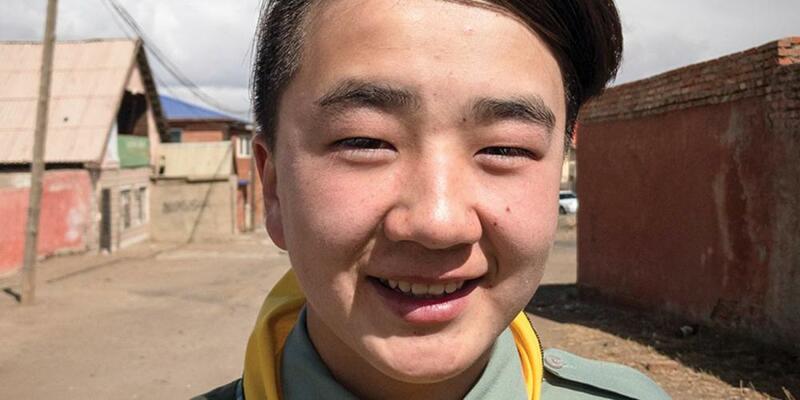 Thirteen-year-old Dulguun Galsan [pronounced: dul-gon] and a friend were walking home from school when they were stopped by two Australian men and a Mongolian woman. But this was the first time that he had seen anyone from Australia. He stopped to listen. He couldn’t understand what the men said because he didn’t know English, but the Mongolian woman interpreted their words into the Mongolian language. One of the Australians handed Dulguun a card with the address of the local Seventh-day Adventist church. Dulguun wanted to play the guitar, so he went to the church the next afternoon. The people were nice and friendly. He returned the next day. On Sabbath, the children made crafts during Sabbath School and, after church, invited him to join their Pathfinder club for a hike. The hike lasted a long five miles (8 kilometers), and it wasn’t as easy as Dulguun expected. He had never hiked before. Partway through the hike, his legs gave out. He felt a terrible pain in his legs, and he couldn’t take another step. Worse than the pain, he had to be carried home. By another Pathfinder. And not just any Pathfinder. By a 13-year-old girl! He joined the Pathfinder club and began going on many hikes. His legs grew strong, and they no longer hurt during hikes. In just a year, Dulguun has learned to play the guitar, earned many Pathfinder badges, and helped the Pathfinder club win Bible contests. He also was baptized. But guitar-playing and badges are not his main goals. Dulguun is praying for his mother, his father, and his older sister. Dulguun’s mother is happy that he goes to church because he has become healthier and happier. But his father and sister complained for a long time that he was spending more time at church than with his family. But as Dulguun has prayed, his father has started going to church whenever it offers free medical checkups. His sister also is changing her mind. She has two sons who were very naughty. Her nine-year-old boy liked to break car windows and treat animals unkindly. The other boy is seven and always disobeyed. To his surprise, both boys came! The boys enjoyed Sabbath School, and now they go with Dulguun to church every Sabbath. Dulguun’s sister is pleased that her sons have become more obedient. She especially is happy because the boys used to come home in dirty clothes after playing outside all Sabbath but now they come home in clean clothes after church. Dulguun is thrilled that his nephews are learning about Jesus. Your mission offering supports Adventist churches in Mongolia, including the church where Dulguun learned about Jesus. Dulguun and 30 to 35 other people attend the Adventist church in Nalliah, a suburb of Mongolia’s capital, Ulaanbaatar. No Adventists lived in the area when the church was planted six years ago, and the church is now led by Global Mission pioneers Batzul Ganbold and his wife. Read about a 14-year-old church member on page 16 of the Children's Mission magazine and about Batzul Ganbold at the link: bit.ly/batzul-ganbold.